Habitat for Humanity International and our insurers require that all new volunteers complete some legal paperwork before they can participate, and renew this information annually. First, there is the Safety Crew Manual that must be read and acknowledged. The Volunteer must fill out an Emergency Medical Release and a Release and Waiver of Liability. If you have not filled out this paperwork with the Roosevelt and Curry Counties Affiliate, you must complete it before you can participate in any activities. For your convenience, we have these documents located here. You may print them, fill them out, and then return them to the supervisor on the Habitat project. Blank forms will also be available on the construction site as well. If you have any questions, please call the office at 575-359-1344 or email us at habitatrcc@yahoo.com. We'll Be Happy to Pick Up Your Donation! 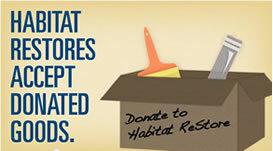 Just give us a call at the Habitat ReStore (575) 356-8250, or at the Main Office (575) 359-1344, to let us know what you would like to donate, where it's located and how we can reach you. As soon as our truck is available, we will schedule a time to pick up your materials. You will be provided with a receipt for tax purposes if you need one. 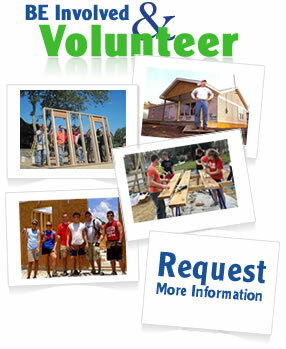 Our mission is to provide financial support for the Roosevelt & Curry Counties affiliate of Habitat for Humanity. The ReStore will sell salvageable seconds, overstocked, used or discontinued building materials and home items that have been donated by individuals, manufacturers, stores and contractors. Donors benefit by utilizing tax deductions and decreasing disposal or storage costs. Customers benefit by saving 40% or more on their purchases. The community benefits from helping our neighbors improve their quality of live while keeping useable material out of landfills. 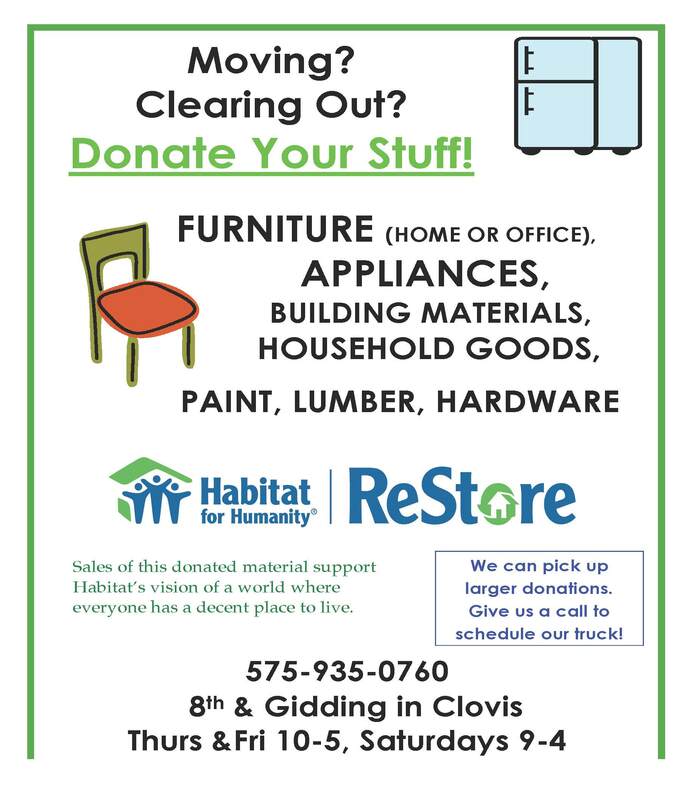 All profits from the ReStore will be used to build decent, affordable homes in the Portales and Clovis areas. Our vision encompasses a large view of building materials and their role in alleviating poverty housing. The United States has been blessed with a multitude of resources. The volume of home improvement material that is thrown away in this country is staggering. We hope to be the 'destination shop" for anyone needing building materials, but especially for those who are attempting to rehabilitate deteriorating housing stock. Contact us today if you are interested in helping us achieve this vision.